THEREFORE WE MUST BE KIND TO EACH OTHER. My son noticed this saying posted on the wall of the little hamburger place where we ate before the opera last week. At the time I thought it was a little overstated. Surely every day is not a struggle. But now as this I begin to tire of winter so early in the season this year, I imagine that each day is going to be harder and longer on the slow road to April! I’ve already got a pretty bad case of the winter blues and it’s only mid-January. Yikes! I’ve got a long way to go…. So, look at these colors! The hot red and yellow, the soothing white and purple. I think it was May last year when we visited Longwood Gardens. I’m trying to remember how it smelled on that glorious day in May. Now would be a good time for spinning. I’ve got a rather imposing project going on my spinning wheel, something I admit I’m avoiding right now. 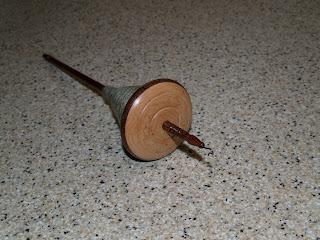 But my lovely Steve spindle might be just the thing to cheer me! 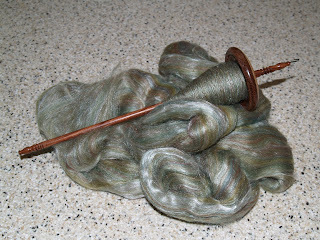 The fiber I haven’t finished spinning is a combination of merino and silk. It’s a very pretty grey/green with white silk streaks. And the finished yarn would make a wonderful lace shawl. I have borrowed my son’s monitor for the past couple of weeks since mine died. He is going to pack his up and take it back to school today, so I will be visually impaired until mine returns from being fixed. So…..I won’t be here, and hopefully I’ll be spinning…. >But did you have a good birthday? January is a month when celebrations are badly needed – we had a friend’s 50th and, of course, Burns night this past weekend, which both helped to warm us up a bit! >In winter, summer is just a rumor; a secret; a scarcely remembered hope. Do we dare believe in whispered rumors? Does the color green really exist? Will there be spring? We can only dream…and in dreaming, believe.